One of the many ways the States of Jersey tries to protect the Island’s natural environment is by identifying some of the most important places for wildlife and protecting them. The Island’s first ecological Sites of Special Interest (SSIs) were designated in 1996 and we now have 19 – mainly in the south and west of Jersey and covering a total of four per cent of Jersey. In this second in a series of posts on Jersey’s ecological SSIs, I’m focusing on what you can find at Les Blanches Banques. The sand dunes of St Ouen’s Bay, and at the heart of the Jersey National Park, are recognised as among Europe’s most important sand dunes. Les Blanches Banques, as they are called, are designated as a site of special interest (SSI) because of their special zoological, botanical, archaeological and historical features. As the most extensive area of sandy soils in Jersey, the dunes support good populations of many animals and plants not found elsewhere in Jersey. 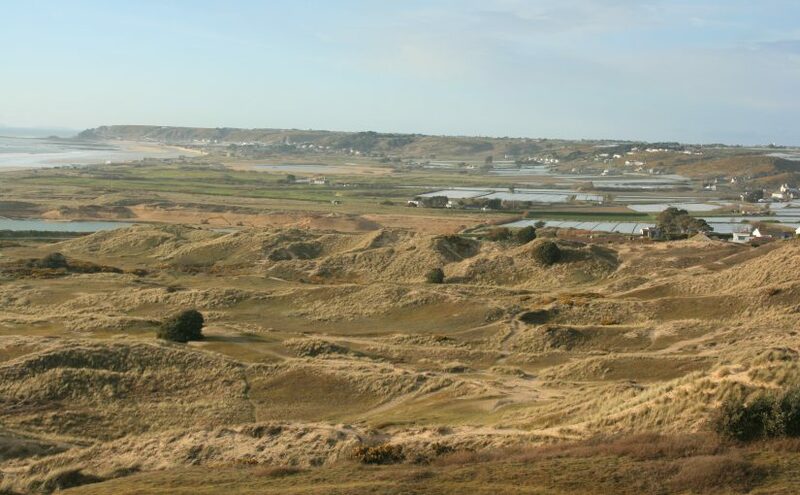 The site is mostly publicly owned and covers 1.15 km2, from the marram grass-covered seaside dune, back towards the scrubby wooded valleys at Les Quennevais. The earliest likely settlers of Les Blanches Banques were the Neolithic (6,000 – 4,500 yrs ago) and their flint scatters can be found outside rabbit burrows to this day. Evidence of settlers since this early date include several menhirs or standing stones and a burial chamber known as the Ossuary where the jumbled bones of 20 people have been uncovered. During the Medieval period the dune grasslands were used for sheep grazing and stacking sea weed to dry, the latter used as fertiliser, or burnt to produce potash. The Five Mile Road, which cuts across the lower dunes was built in the late 1800’s. During this time, granite sea defences were also built along the bay, transforming dunes which once covered almost the entire bay, into productive agricultural land. At the outbreak of war in 1914, the Jersey Militia used the area for training. In addition, a prison camp was constructed on the lower dunes to house 1,500 German prisoners, the foundations of which can still be seen today. There are three main areas which are targeted for management on the sand dunes. The stabilisation of the dune system caused by the construction of the seawall now allows for the growth of less specialised fast growing vegetation which out-competes the plants adapted to sand dune conditions. The acidity of the grasslands is increasing over time – consequently changing their ecology. It’s essential for rangers to mow selected areas and cutting back scrub i to maintain the grasslands. devices, would dominate the landscape very quickly at the expense of native wildlife. Grazing is key to the health of the dune grasslands and in the absence of traditional grazing livestock, rabbits play an important part in keeping grasslands sufficiently short to enable the low growing spring annual flowers so special to Les Blanches Banques to flourish. Sandy soils are very prone to erosion and Les Blanches Banques is a popular site, visited and enjoyed by many Islanders and visitors. To limit the amount of sand lost, dune blow-outs need to be fenced and stabilised, allowing colonising plants such as marram grass to grow. Les Blanches Banques is among the ten largest single dune systems in the British Isles. It is also the fourth richest in flowering plants. The species-rich dune grasslands also support a very high density of insect life. There are at least 26 species which aren’t found or are now extinct in Britain, and a further 63 species Nationally Scarce species. More than 400 plant species have been recorded on Les Blanches Banques, many unique or special to the Channel Islands. Those of scientific interest include the Lizard Orchid, with its flower resembling its reptile namesake; the Dwarf Pansy, in Great Britain, found only in the Channel Islands and the Isles of Scilly; the Dog Violet which is near-threatened in the UK; and the Sand Crocus, with its diminutive mauve flower. Amphibians and reptiles enjoy life on the sand dunes, which harbours five of Jersey’s seven species. Palmate Newt and Slow Worm are present, but UK visitors may be more excited to see the exotic-looking Green Lizard, with its emerald and aquamarine colouring. Also present are the Western Common Toad, rather than the Common Toad of Britain and northern Europe. The Grass Snake, one of Jersey’s rarest animals, can be seen here on occasion. The sand dunes remain one of their few strongholds. The Blue Winged Grasshopper, the Firebug, the Queen of Spain Fritillary Butterfly, the Lesser Bloody-Nosed Beetle, exuding a minute drop of blood when alarmed and the Sand-Bear Spider, which ambushes its prey from the entrance of its burrow, are all of particular interest to Jersey and our sand dunes. The Skylark, a ground-nesting bird with an enchanting song, is in decline across Europe and is a local Action Plan species, as is the Stonechat, a bird whose call resembles the sound of two pebbles being knocked together. The sand dunes are very rich in lichens, with 59 different species recorded, including the very rare and descriptively-named Scrambled Egg Lichen, and also the rare Dog Lichen. Although mushrooms and toadstools are commonly found across the dunes, the types of fungus found here tend to be largely uncommon such as the Winter Stalkball and varieties of Earthstar and Woodwaxes. Every visit to Les Blanches Banques will reward you with a new experience of a natural wonder – from being buffeted by Atlantic gales with a pair of ravens rolling in the turbulence squawking above you, to the smell of dry grasses while glimpsing flashes of blue, a distraction signal from blue winged grasshoppers and a reminder that it’s always worth bringing your camera. You can get to the sand dunes easily from St Ouen’s Bay, or Les Quennevais – a path leads directly from the Railway Walk. There is car parking at Les Quennevais, Le Braye, La Pulente and Mont à la Brune. You can plan a day out to include a visit to the sand dunes, followed by time spent on the beach. Much of the lower dune is fairly flat but the footpaths are unsuitable for most wheelchairs and buggies (pushchairs). You can get to St Ouen’s Bay on the number 12 and 22 buses. The number 12a and 15 buses go to the airport via Les Quennevais. For the more adventurous a walk from Les Quennevais into St Ouen’s Bay can be very rewarding. The sand dunes of Les Blanches Banques are well worth a visit, where the tranquillity and the vibrancy of wildlife busying around you are guaranteed to remain in your memory for a long time to come.